A wonderful Hidden Hero, an amazing charity, and the GM of their nominating hotel just happened to be at the presentation – we love it when a plan comes together! What a way to mark the 500th R2R nomination – enjoy! The Buddy Bag Foundation provide children entering emergency accommodation with Buddy Bags to restore a sense of safety and security in their lives. Pam has been supporting Buddy Bag Foundation for the last 4 years. The Buddy bags make a real difference to the children. The children are often removed from the family home or from school and arrive in women’s refuge with the clothes that they are standing in. The Buddy bag contains 12 essential items that make a real difference. A frame to contain a happy memory. A rucksack they can use for school or a cuddly teddy that they can call their own. Pam’s role is very challenging as she has to constantly juggle and follow up to obtain the information that is required before we can pack the bags. Pam is a volunteer and is totally responsible for the co-ordination of Buddy bags to women’s refuge centres. From a standing start of zero, Pam has identified over 300 women s refuge centres in the U.K., creating a comprehensive list of suitable end users for our buddy bags. On average we send 540 Buddy Bags to 18 refuge centres per month which requires a lot of co-ordination and admin. Pam is consistent, persistent, and never gives up until she has received all the information. She arranges the preparation of paperwork including delivery notes, courier logs and co ordination of bags via courier to the women’s refuge. 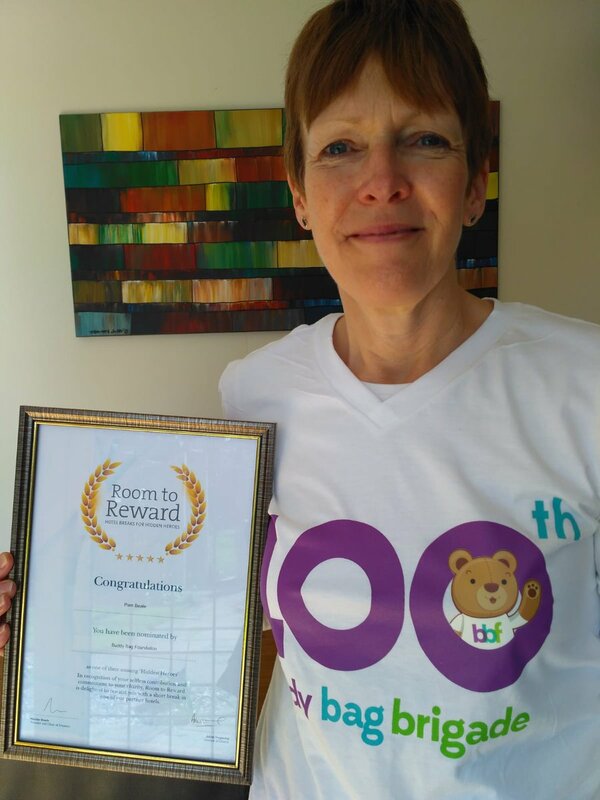 This is a tiring but essential job and Pam delivers, often dealing with challenges totally beyond the call of duty and going the extra mile to ensure every child receives one of our bags of love. Pam was presented with her award by BBF Founder, Karen Williams, at a landmark event of their own – the 100th Buddy Bag Brigade. R2R came into contact with the Buddy Bag Foundation courtesy of our fantastic hotel partners, Moor Hall Hotel & Spa. Sam Goss – General Manager – was present at the Brigade and saw his introduction bear fruit with Pam’s award. We would like to thank Sam Goss at Moor Hall Hotel & Spa for the introduction, Karen Williams and the Buddy Bag Foundation for the nomination and Pam for making a difference and sharing her story with us.